The U.S. Geological Survey says the quake struck late Tuesday about 21 kilometers (13 miles) northeast of Hualien, on the island's east coast. Taiwan's official Central News Agency reported that the ground floor of the Marshal Hotel, a building in Hualien district, had caved in and people were believed to be trapped inside. The agency posted photos showing a road fractured in several parts. Taiwanese media reported that aside from the cave in on the ground floor of the Marshal Hotel, a separate hotel known as the Beautiful Life Hotel, is tilting. 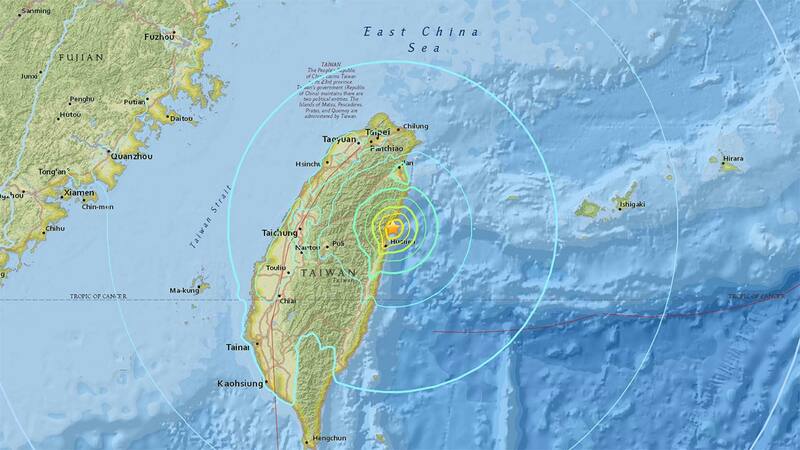 Tuesday night's quake follows one over the weekend off the coast of Hualien on the east of Taiwan, which lies along the famed "Pacific Rim of Fire" known for seismic activity from Alaska to Southeast Asia. The agency quoted a spokesman of Taiwan's Executive Yuan, the governing cabinet's office, as saying that search teams from other areas were headed to Hualien. The preliminary information suggests the quake was about 9.5 kilometers (6 miles) deep.